JERUSALEM – The story of the Armenians of Jerusalem, a fascinating tale of courage, hope and endurance, sprinkled with the inevitable grains of turmoil and tragedy, is planned to be told, for the first time in a feature film. While there have been previous attempts to tell part of the story in a book or a film, the focus has always been too narrow to encompass the whole gamut of the Armenian presence in this city regarded by many as the centre of the world. Countless newspaper and magazine articles have been written about this dynamic community which gave the land its first photographic studio and printing press, and the world the great musician Ohan Durian. But, again, these essays touched only the periphery or pinpointed only passing or intriguing milestones along the journey. 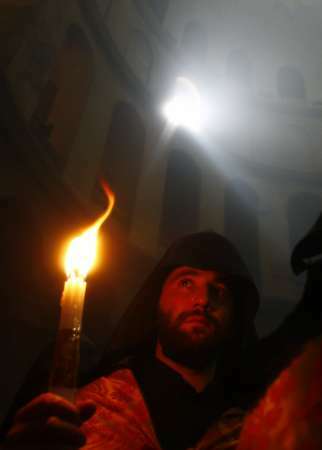 Those who hold Jerusalem dear to the heart are fond of saying this is where history is said to have begun: for the Armenians of Jerusalem, their story began more than 2,000 years ago, before the advent of the Christian era. Australian-Armenian journalist/foreign correspondent Arthur Hagopian, the former Press Officer of the Armenian Patriarchate of Jerusalem, who has been acting as consultant on a 3D IMAX film currently being shot in Jerusalem (www.jerusalemthemovie.com), is heading the project to bring the story of the Armenians of Jerusalem to the big screen. A few years ago, Hagopian launched a website project (http://arthur-hagopian.com/Armenians/Kaghakatzis/index.htm) aimed at preserving and maintaining the history, culture and traditions of the “Kaghakatzi” (native/city dweller) Armenians of Jerusalem, one of the three groupings of Armenians in the city. The “Kaghakatzi” bear the distinction of being the first Armenians to settle in Jerusalem, staking out the Armenian Quarter of the OId City as their choice of domicile. The other major grouping are known as the “Vanketzi” . They are mainly genocide survivors or their descendants and live within the confines of the convent (“vank”) of St James, seat of the Armenian Patriarchate. The “Kaghakatzi” project is also tracing and cataloging the ancestry of the denizens of the Armenian Quarter, a community that is a genealogist’s dream: every single “Kaghakatzi” is related to every other “Kaghakatzi,” either directly or indirectly, in an unbroken chain that goes back centuries, according to Hagopian. The “Kaghakatzi” enterprise has so far netted over 3,000 names, culled from the official “domar”s (records) of the Armenian Patriarchate, personal recollections, and the odd document or two: but at its peak, the whole Armenian contingent in Jerusalem, the “Kaghakatzi”, “Vanketzi” and the small number of Catholic converts, totalled more than 15,000. That number has shrunk alarmingly over the years, the first major loss depletion occurring in 1948 in the wake of a mass reverse exodus to Armenia. Historical records are scant, but some scholars trace back the beginnings of the Armenian presence in Jerusalem to the days of empire of Tigranes II, whose armies had swept into the region circa 100-150 BCE. It is unclear whether Tigranes did actually seize Jerusalem, with the argument weighted heavily against the assumption that he did not. However, when the main body of his great army left on its mission of further conquests, he left behind sizeable garrisons and colonists some of whom eventually made their way to the provincial Judean city. They settled in the land of milk and honey and prospered. When some four centuries later Armenia became the first nation in the world to accept Christianity as its state religion, their numbers were augmented by the throngs of pilgrims who made the arduous journey from the mountains of the motherland, to come and pray at the birthplace and tomb of Jesus. The newcomers built churches and monasteries, embellishing them with breathtakingly crafted mosaics, some of which still survive, resplendent in their undying colors. The latest, fortuitous, discovery was only made a few years ago, in the Musrara quarter outside the Old City, when workmen stumbled upon the ruins of another Armenian monastery. “We are planning to tell our story through the medium of a feature film that will delve deep into the soul of this unique segment of humanity and answer the question: what makes the Armenians of Jerusalem tick?” Hagopian states. Hagopian will be writing the script and is thinking of directing the film. His vision of an opening scene is a panorama of the sweeping army of Tigranes as they overrun the region and pause on the borders of Judea. In the distance, partially obscured by the haze of battle, the outline of Jerusalem shimmers invitingly. Some frames later, the screen is filled with the scene of a long line of camel caravans, trekking through the Judean wilderness, the hoofs of the heavily laden animals raising pillars of dust along the trail. These are the first Armenian pilgrims to arrive in the Holy Land: they head towards the Khan el Ahmar caravanserai, situated on the site of the Inn of the Good Samaritan, where they will later build a church and a monastery. But before the first frame is shot, Hagopian must secure the funds necessary to cover the cost of production. “We are confident there is sufficient interest not only in the Armenian or Christian world, but everywhere else where this enchanting city is revered, for sponsors and backers to come forward and provide the finance for the film,” Hagopian says. Hagopian imparts a sense of urgency to the project because of the relentless attrition in the number of Jerusalem Armenians, particularly the elderly who know and have lived the stories. “A few years ago, we lost the last of the Armenians matriarchs of Jerusalem. There are so few of them left now, there is a real and perceived danger that if we do not tap the bank of memories of these living chronicles now, then when they are gone, we will be left with precious little,” Hagopian warns. “In the cobblestoned Armenian Quarter of the Old City, every tile has a tale to tell. We plan to cajole those tales out of the past, relive halcyon days of innocence and simplicity, ” he adds. Although loath to reveal more details about the script, Hagopian says an incident that occurred during the 1948 Arab Israeli war is crying for recreation. “We were gathered across from the kitchen of a neighbor, in one of the converted cloisters of the convent of St James where we had taken refuge from the fighting, when out of the sky, a terrifying dark object suddenly plummetted to earth, landing in the doorway?” Hagopian, who was one of the children present, recalls. Hagopian says it is still early days to venture an estimate of the costs involved. The project, code-named “Cobblestones,” will be administered by a new company to be incorporated in Sydney. Most of the images I used in this video are also from the Armenian quarters in Jerusalem.